But unfortunately, she is. So itâ€™s up to us â€œkidsâ€ to enjoy these yummy treats. With the Awards Night so near, I canâ€™t help but feel stressed (actually, â€œstressedâ€ is an understatement). Thanks to the volunteers, everything is falling smoothly into place, but still. Itâ€™s the first time weâ€™re having something like this that I canâ€™t help but think about all the possible scenarios. What if we got stuck at the venue because of the egress requirements? Abe and I will have to stay behind even if it takes sleeping there. You know what I mean? The task and the responsibility are so daunting that you canâ€™t help but envision horror stories while you sleep (or while youâ€™re awake). Iâ€™m still standing firm to what I said before: Iâ€™m excited about the Awards Night, but at the same time, I canâ€™t wait for it to be over. Hopefully next week, my email inbox will be back to normal and Iâ€™d be able to sleep normally again (without Awards Night nightmares). Anyway, I was stressing yesterday morning over the judgesâ€™ score sheet (oh, yeah, I now know who wins! Hehe. Some were expected, but some were not), when my dad knocked on our door with a pleasant surprise: I got a dozen egg-shaped doughnuts from Krispy Kreme. Abe, Sasha and Rico will attest to this: I have a sweet tooth. Abe once even chastised our trash can full of junk food wrappers, and added that we never seem to run out of â€œunhealthy food.â€ Every time he opened our fridge, at least one kind of junk food is inside. Well, I donâ€™t know. Maybe Marc and I are just enjoying our newly wed statusâ€”no kids to worry about unhealthy diet yet. Although Iâ€™m forever a Dunkinâ€™ Donut fan, I actually like Krispy Kreme better than Go Nuts and Celloâ€™s. These three â€œgourmetâ€ doughnuts are all equally sweet to me, but itâ€™s the dough that makes the difference. 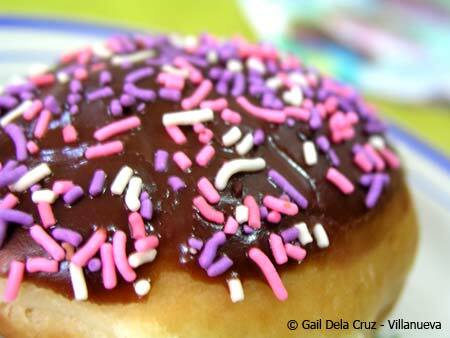 Taken too often, I think these doughnuts wonâ€™t taste as good anymore (too much of the sweetness can be nakakasuya). Lucky for me, we live far from the nearest Krispy Kreme branch, or Iâ€™d probably end up with an incredibly high blood sugar level every single day. Heh. According to the flyer I got, the egg-shaped Krispy Kreme doughnuts are only in stores until the 15th of April. 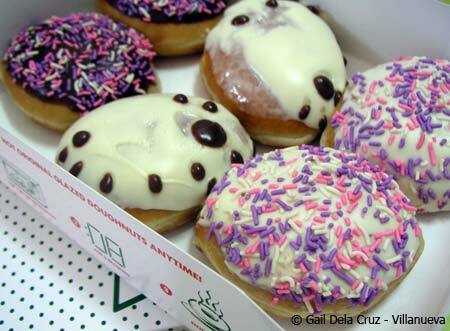 Krispy Kreme is also going to have activities in their stores on Sunday (April 8) since itâ€™s their first Easter here. I wonder what theyâ€™ll do? Egg-shaped doughnut hunting? This entry was posted on Friday, 30 March 2007 at 12:18 am and is filed under Food. The 2007 Philippine Blog Awards: Who do you think will win? my 2 girls were thrilled to have doughnuts. I could only take a bite . Sarap the cream cheese flavor. @noemi: yep, the cream cheese is also good! But I’m a chocolate addict hehe. @Jaypee: Hehehe yup sarap nga! Try mo. Although I think I’d still prefer the honey-glazed donuts nila. OMG they look so awesome!